Google has started rolling out an update for its Fit app that now includes a personal trainer app for Android Wear, a home screen widget, apart from new monthly and weekly summary views. The new Fit Challenge app for Android Wear shows users how to properly do exercises such as sit-ups, push-ups and squats using messages and animations. Users can choose any one of the exercises followed by a difficulty level. The Activity Screen shows the progress and informs them about the how many repetitions they have made and how much time it would take to achieve the goal. It also encourages users by flashing inspirational messages. Once the routine is completed, a message showing a compilation of activities done is shown. Repeating the exercise or the tutorial is possible by swiping right from the screen. It is worth mentioning that the challenges stretch for 30 days and start with an easy routine of five reps a day that increases over time. Users will also be alerted every day to do their routine exercises. The information will be automatically synced with the Google Fit website and Android app. 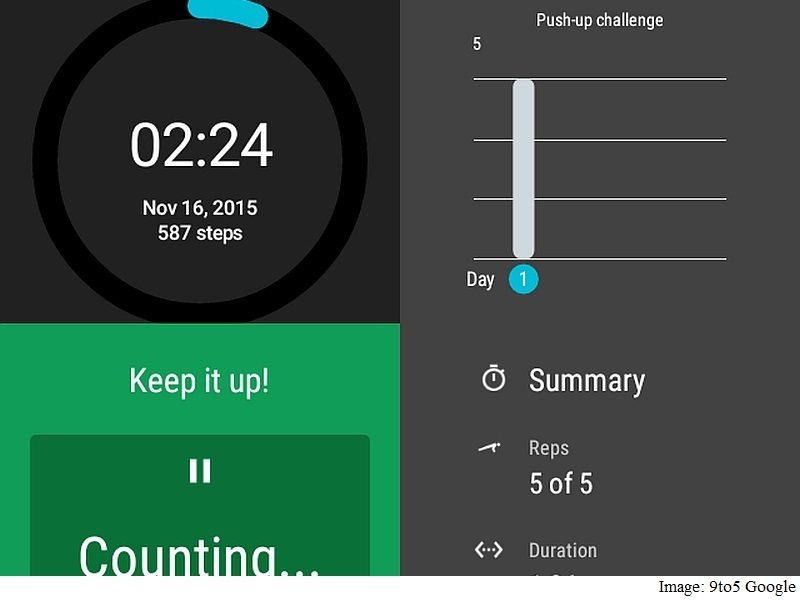 The regular Fit app for Android Wear will show users their progress, 9to5Google notes. A digital interactive watch face for Android Wear smartwatches has also been introduced as a part of the Google Fit update. This might come as a welcome change for users as Google Fit for Android Wearfeatured an analogue watch face since quite some time now. The updated app is gradually rolling out in phases, but is already available on the Google Play store in India. For those who don’t want to wait, an apk file can be downloaded from apkmirror website. Notably, users are complaining that with the latest update, users are unable to add new activities, and can only choose from pre-defined ones. The ability to log weight has also gone. Google in May this year updated its Google Fit app with new features that included estimation of distance covered and calories burnt.